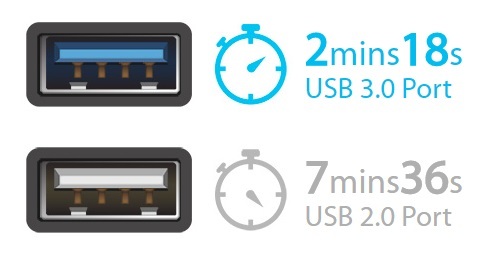 USB 3.0 ports offer transfer speeds of up to 5Gbps, 10 times faster than standard USB 2.0. The 7 data transfer ports mean you don't have to switch between devices. UH700 can deliver up to 5V/1.5A output that charges 50% faster and saves up to 30% on charging time. Fully charging a Galaxy S6 edge takes just 100 minutes with the UH700 USB Hub, whereas it takes 150 minutes with a USB Hub supporting 5V/1A output. *Exact charging time may vary and is subject to actual charging situations. Note: Does not require drivers for Windows 10/ 8.1 / 8 / 7 / Vista / XP or Mac OS X and Linux systems. Backward compatible with USB 2.0/1.1 and the actual transmission speed is limited by the setting of the device connected. Equipped with USB 3.0 ports, the UH700 can transfer a 1080p movie under 2 minutes 18 seconds, whereas it takes 7 minutes 36 seconds with a USB Hub equipped with USB 2.0 ports. * The actual transmission speed depends on the setting of the device connected. The UH700 is perfect for anyone who has a computer with only one or two USB ports, and wants easier access to additional ports without having to switch between devices. * Many laptops have only one or two USB ports. * Many computers have USB ports in difficult-to-reach locations. UH700 has a sophisticated circuit design with multiple protections for your devices against over-heating, over-current, over-voltage and short circuit. A built-in surge protector keeps both your devices and data safe in the process of transferring data. UH700 support USB ports hot swapping that can be safely connected and disconnected while the computer is powered on and running. A dim white LED indicator on the power button helps visualize the connection status and similarly 7 dim white LED indicators beyond each USB port also indicate whether the devices are properly connected.